- Twin Feedback path: it is what this is which is the main purpose of this page. On tracing out the circuit of the M11 its roots in the Buchla 291 are very evident—the filter core is pretty much a straight copy, with a handful of component value changes, and one extra component, empirically chosen to seemingly 'pep it up'. 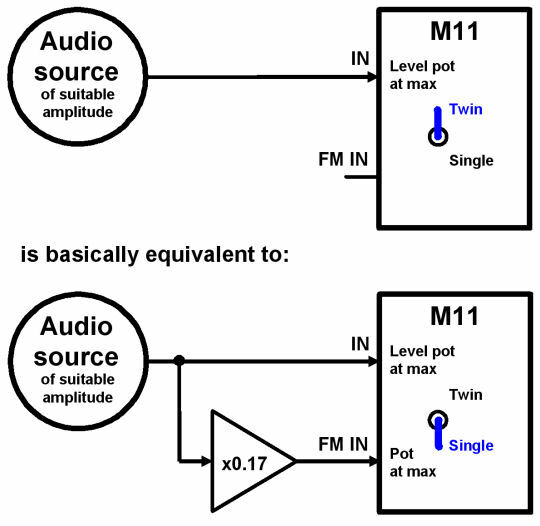 It is also plain to see that the above statement about the 'twin feedback path' is erroneous, as the 'single/twin' switch merely connects an attenuated amount of the input audio signal through to the main frequency controlling sub-circuit: it is tempting to call this 'feed forward', but even the use of that term may not be completely rigorous, as the signal concerned doesn't actually feed in directly again to the downstream version of the audio signal—however, feedback it most certainly isn't. At the time I thought that this being the case, it might be interesting to see if one could sensibly 'emulate' this feature of the circuit by external patching, and recently I have made just such an attempt. - then emulated twin to finish (there's a small 'blip' between the last two changes). - M11: M15 #1 square out to In, level pot fully CW; 138 #1 out (via 150) to FM in, pot fully CW; Frequency pot approx 2.2; Bandwidth pot approx 7.8; resonance almost fully CW; 12dB output is recorded.